Dr Shebani offers the best dental care when it comes to competence and concern. Understanding how distressed parents can feel, if their child lacks access to the best dental care, Dr Shebani and her team work round the clock to ensure the best and most advanced dental care is available for your little one. The best dentist Portlandoffers, Dr. Shebani is a stalwart and pioneer in the field of pediatric dentistry with a rich experience and impressive credentials you can trust. When it comes to preventative or therapeutic dental care, Dr. Shebani and her team excel in more ways than one. Whether it is caring and sensitive treatment, the latest technologies and facilities, medical knowledge or application of the same, she and her team are heads and shoulders above the rest. Her well deserved reputation for excellence easily makes her the best dentist in Portland. Choose her supervision and medical guidance and benefit from stellar dental care for your child. Why Opt for Dr. Shebani? Do you seek unparalleled professional and medical expertise? Are you looking for the best dentist in Portland? The reason Dr. Shebani is the right choice, is because she offers both competence and a humane approach, making her the ideal choice for caring parents who naturally want the safest, secure and specialized treatment for their child. 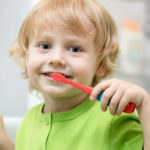 So, head out to her clinic and know the value of her healing touch, when it comes to pediatric dental care.